I’m always looking for new ways to incorporate lavender in cooking which is what compelled me in September to attend a class on botanicals at Old World Levain (OWL) Bakery in Asheville, NC. By definition, a botanical is anything derived from plants. This includes spices and grains. You can add botanical elements to most any recipe and explore seasons, cuisines, and nature. I learned how to make crystallized herbs, a technique that I could not resist adapting to lavender. Check out the recipe, below, for lavender “sprinkles:” I used dried culinary lavender in place of the chopped herbs. In a skillet, bring water and sugar to a boil and stir gently until sugar is completely dissolved. Keeping syrup in center of pan, allow to boil until you see very large, glassy bubbles, and white crystals on the side of the pan. When ready, throw in your herbs (or dried lavender buds) and stir vigorously continuously without stopping until your herbs stop generating foam and start to separate. Remove from heat immediately and pour onto a sheet of parchment. Allow to cool, and break up clusters with a rolling pin if necessary. 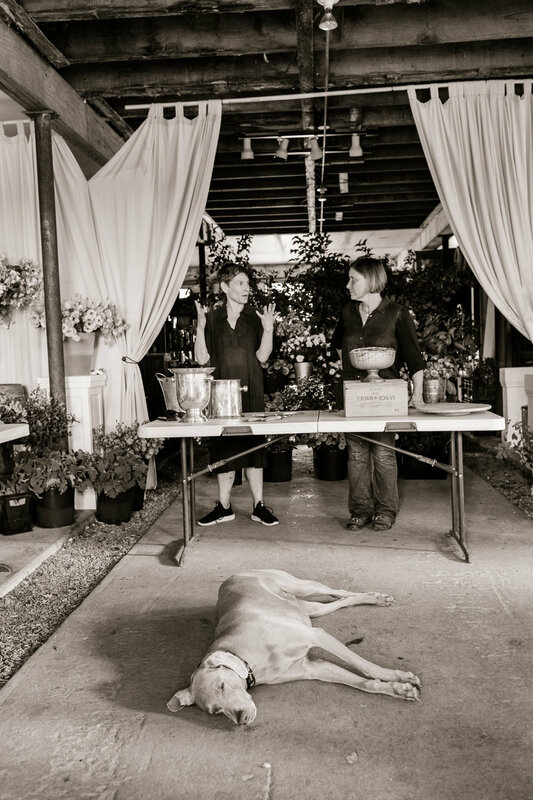 I recently spent a joy-inducing two days at LynnVale Studios and Farm attending a workshop that embodied two of my favorite things: food and flowers! It was a memorable experience involving hands-on flowers and instruction in various aspects of flower farming - everything from seed sourcing to planting, to harvest and design, and even sales and marketing strategies. I learned so much! What's more, it's not often you go to a workshop and enjoy a low-key presentation in the comfort of your hosts' living room. The setting and mood was simply lovely. My first intro to LynnVale was in 2015 when my husband and I attended a field to vase dinner event there which made a lasting impression on me. I have admired LynnVale Studios ever since and was excited when I realized my schedule this year would allow me to attend the workshop. Day 1 included floral design demos by host Andrea Gagnon and Sidra Forman followed by DIY floral arranging using flowers and foliage grown and gathered on the farm. We also learned helpful tips on photography, color placement, and the effects of venue lighting on flower color. On day 2 we got an up-close and personal look at the farm, learning about growing techniques and harvesting and all about the inner workings of a flower farm. In short, it's always good and helpful to see how other flower farmers operate. This was a wonderfully enriching experience, and I appreciate meeting other flower powers along the way. By the way, if you ever have the opportunity to attend a field to vase dinner tour event, go! Hello, June! Thank you to everyone who came out to the farm to purchase peonies last month. I appreciate all of you! We had a ton of rain in May and it was a chilly spring in general which put a lot of spring blooms behind schedule but the peonies were perfectly timed this year for Mother's Day. The farm received a lovely mention in this month's issue of Winston Salem Monthly magazine. You can read the article here. Cherries are in! I have not been lucky enough to have my own tree full of cherries (yet!) so I made a trip to Levering Orchard this week and discovered a bumper crop. If you've never been there it's definitely a pleasant adventure - located in Cana, Virginia. The following recipe for Bourbon Infused Sweet Cherry Galette is one of my favorites, and once you get the cherries pitted it's quite easy to throw together. Its especially wonderful served with a scoop of vanilla ice cream. Make the pastry: Stir together 1 1/4 cups all-purpose flour, 1 teaspoon brown sugar, and 1/2 teaspoon kosher salt. Add 1 stick butter (cut into cubes) and work together with your fingers until mostly combined. Add 2 to 3 tablespoons cold water, stirring with a fork or rubber spatula, until the dough comes together. Form into a disk, wrap in plastic wrap, and chill for about 1 hour. Meanwhile, make the cherry filling: In a saucepan combine 2 cups pitted fresh cherries, 1/4 cup brown sugar, 2 tablespoons bourbon, 1 teaspoon lemon zest, 2 teaspoons fresh lemon juice, 1/2 teaspoon vanilla extract, 2 tablespoons cornstarch, and a pinch of salt. Place over medium-high heat and bring just to a simmer, stirring constantly until slightly thickened. Remove from heat and stir in 1 tablespoon butter. To assemble: Place parchment paper on a baking sheet. Roll out dough on top of parchment paper into a circle about 1/8 inch thick. Spoon cherry filling in the center of dough leaving about 1 inch around edges. Gently fold the edges of dough up. At this point, I like to brush the edges of the pastry with an egg wash but this step is optional. Sprinkle with turbinado sugar. Bake in a preheated 425 degree oven for 10 minutes, then reduce heat to 375 and bake until the crust is golden, about 45 minutes. Serve warm or at room temperature.